I recently received a lovely package from NiNE FRUiTS PiE on Etsy. 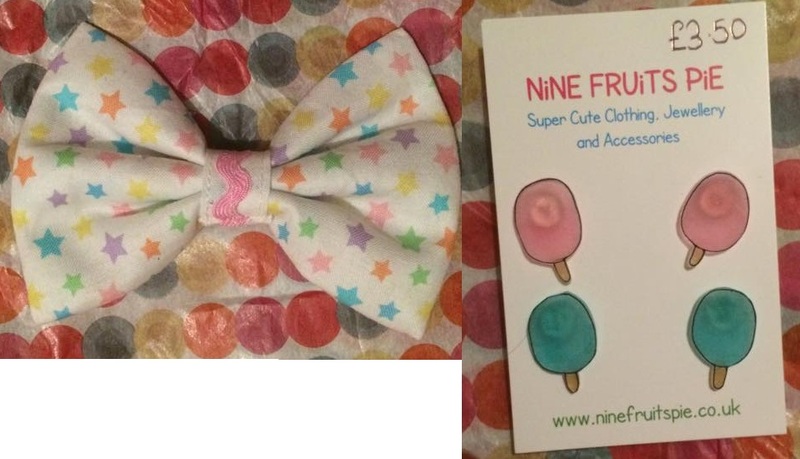 NiNE FRUiTS PiE sells mainly accessories and jewellery. Claudia from NiNE FRUiTS PiE has kindly sent me some of her gorgeous kawaii pieces to show you guys. 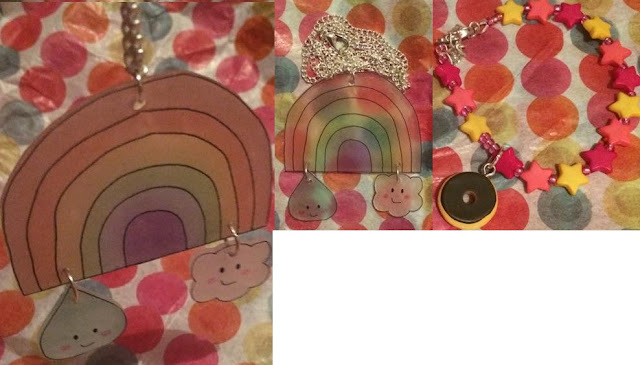 The first thing I opened is this gorgeous rainbow necklace with a cloud charm and a little raindrop charm. This is made from shrunk plastic which has been hand drawn and coloured. It's so cute, I love it - it will look lovely worn with a vest top. I then unwrapped this adorable donut charm bracelet. This piece is surprisingly weighty - the quality is great. I love the cute donut charm and the little stars are gorgeous too. Claudia also sent me this precious starry hair bow with some pink ric-rac ribbon in the middle. I'm in love with ric-rac at the moment! This bow is very well made, I can't wait to wear it in my hair. Also, how cute are these candy floss earrings?! They're made of shrunk plastic like the necklace and they make me think of being at the fairground. Love it! As you can see, NiNE FRUiTS PiE sells lots of beautiful handmade jewellery and accessories. Definitely check their shop out, there's plenty of different things on there to suit all tastes. Everything that I received is fab quality and I'm happy to recommend the shop to all.